I’ve been to the circus, and you all know how I get once I’ve been to the circus! But instead of giving you guys a whole bunch of amazing tips and tricks on how to host classic red and white striped animal filled circus parties, I am going to go a more Disney route. My favourite Disney movie has to be Dumbo. It’s based in a circus, so this is where our circus theme comes in, but the highlight of the story is that a A young elephant gets drunk and sees pink elephants. 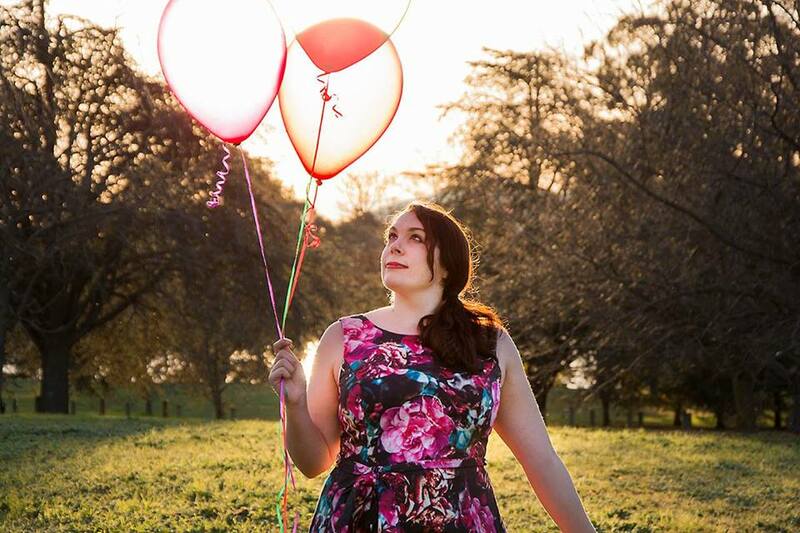 It’s hilarious and would make a great circus theme or children’s birthday party. 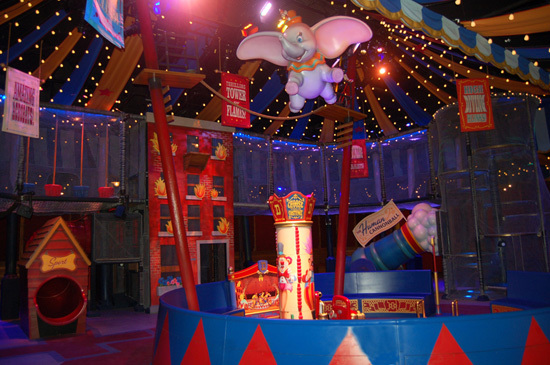 Here are some fun ways you can have your own Dumbo circus party. As I mentioned before, I am a huge fan of backdrops and this one from Where In The Disney World takes the cake. It looks like a real life ringside and the moment you step into the venue doors you are under your very own big top. With plastic walling around the main area painted to look like the ringside of the circus, fairy lights and red and white drapes hang from the roof. At the side there is a large painted banner of the firey roof that Dumbo jumps off of at the end scene of the movie, and there is even a large statue of Dumbo himself hanging from the roof in mid-jump. It pretty much captures the entire idea and scene of the Dumbo movie and makes for a great decoration for a party. A cute idea to incorporate the Dumbo into your party is to include really cute printables for your guests to take home. 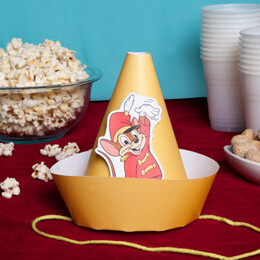 Party hats are an essential part of a child’s party, but the general triangular party cone end up being really tacky. Take some advice from Family.Go.Com and print out your very own Dumbo hat for each and every guest and add a cute little Timothy Q Mouse in the little boat of each one. Imagine your little children running around wearing one of these – ah, too cute! 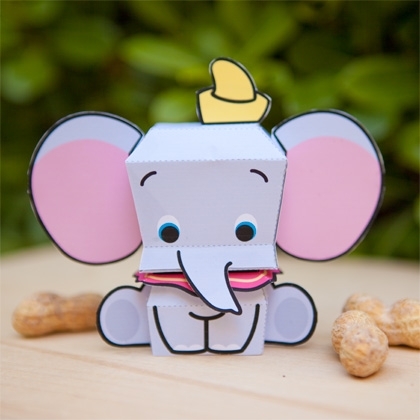 In the vein of printables you can use this cute one from Spoonful and create a little Dumbo gift box full of peanuts (or maybe peanut butter macaroons! Yum!) for all of your guests to take home. Folded up it makes for a super cute table piece as well! You can get the printable from the link above. At the party the food is something that will make a great everlasting impression. 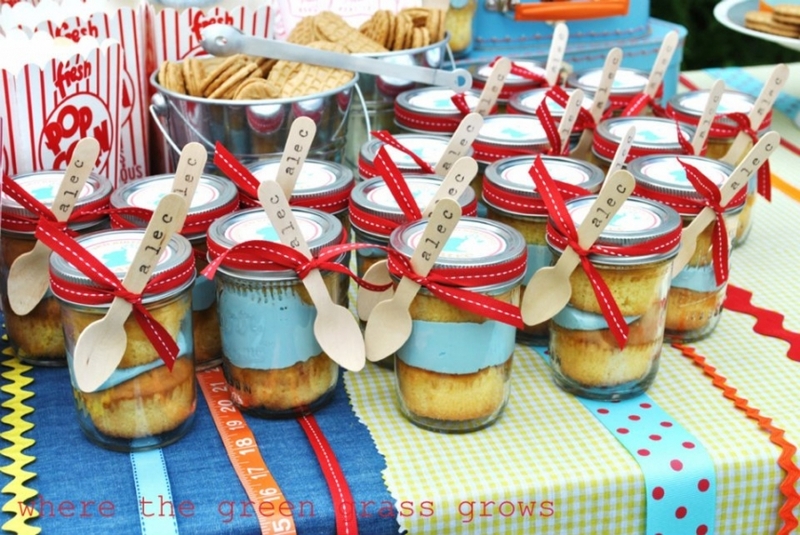 Make yourself peanut themed food like Chicken with Peanut Dipping Sauce (you can find from the Spoonful link above) or peanut butter cupcakes in a jar like the ones from Pink Peppermint Prints above. You can make peanut shaped cookies and serve classic circus themed foods such as cotton candy, popcorn and peanuts in a bag. 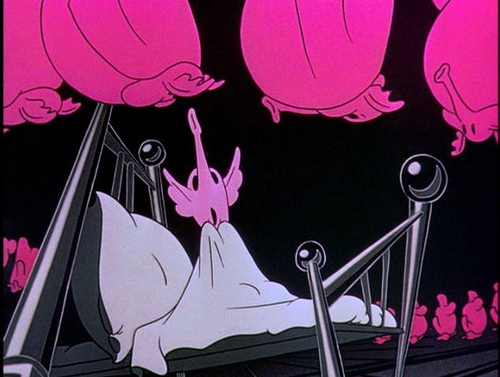 For a more adult touch, add in the classic element of Dumbo – champagne and pink elephants of course! Make your adult guests see the pink elephants amongst them! If you plan on making them see pink elephants, or hosting any type of Dumbo themed party, let me know how you go with it! Email me at thepartyconnection@hotmail.com.